Israeli Prime Minister Benjamin Netanyahu made a visit to the White House Monday afternoon for a meeting with President Donald Trump. 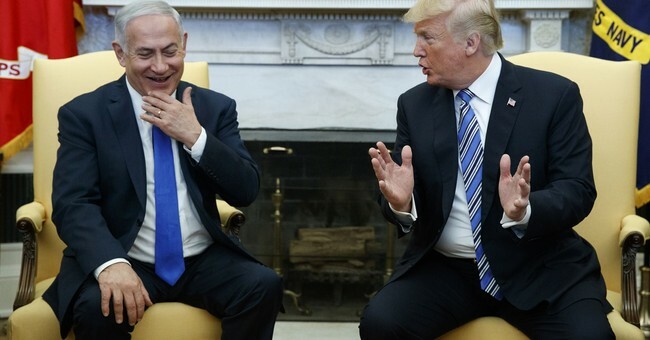 Before heading into the Oval Office, both leaders participated in a signing ceremony to officially recognize the Golan Heights as Israeli territory. Netanyahu thanked the President for his support of the country and called the move "historic justice." ????? ????? ????? ??? ?? ?? ????? ???????? ????? ???? ?????. ??? ??????? ?????? ?????! Netanyahu was scheduled to speak at AIPAC Tuesday, but a Hamas terrorist attack in Israel cut his trip to Washington short.